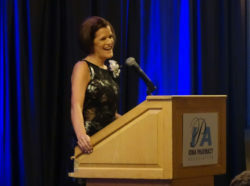 The Iowa Pharmacy Association (IPA) recognizes individuals for their contributions of leadership, patient care, professional involvement, and public service. The following awards given to CPHS faculty, students, partners and alumni were presented during IPA’s annual meeting, June 8-9, 2018, held in Des Moines, Iowa. 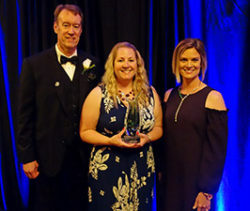 Michelle Bottenberg received the Excellence in Innovation Award that recognizes pharmacists who have demonstrated significant innovation in their respective practices. 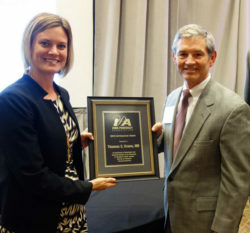 The Karbeling Leadership Award was established by the IPA Foundation as a tribute to the leadership and service of the late Jerry Karbeling. The 2018 award recipient was Michael Harvey, P4 student. Dr. Thomas Evans, AS’81, with the Iowa Healthcare Collaborative, was the recipient of the IPA Appreciation Award, which was created in 1988 to recognize individuals and corporations for their support of organized pharmacy in the state of Iowa. The Board of Trustees consists of eighteen pharmacists, one pharmacy technician, and two pharmacy students from diverse practice settings throughout the state. Cheryl Clarke, PH’86, CPHS faculty member & IPA’s current president-elect, was installed as the association’s 140th president. Clarke was elected to the position during the previous year’s election. Sally Haack, PH’02, was among those elected as new board members for 2018-2019. John Rovers, Professor of Pharmacy Practice, was unanimously elected as Honorary President. Congratulations to CPHS students, faculty, colleagues, and alumni who were elected to new positions or recognized for their accomplishments at the IPA Annual Meeting.